She was 8 when she and her little sister debuted in Moorhead’s very first ice show. But the Moorhead second-grader was hooked. Along with her sister Shelly Frisch Schreiner, she embarked on a passion for skating that can be traced directly to this weekend’s 41st Moorhead Ice Show at the Moorhead Sports Center – the 30th that Dawn has directed, starting the year after she graduated from Moorhead High, and a far cry from that humble launch back in 1978. 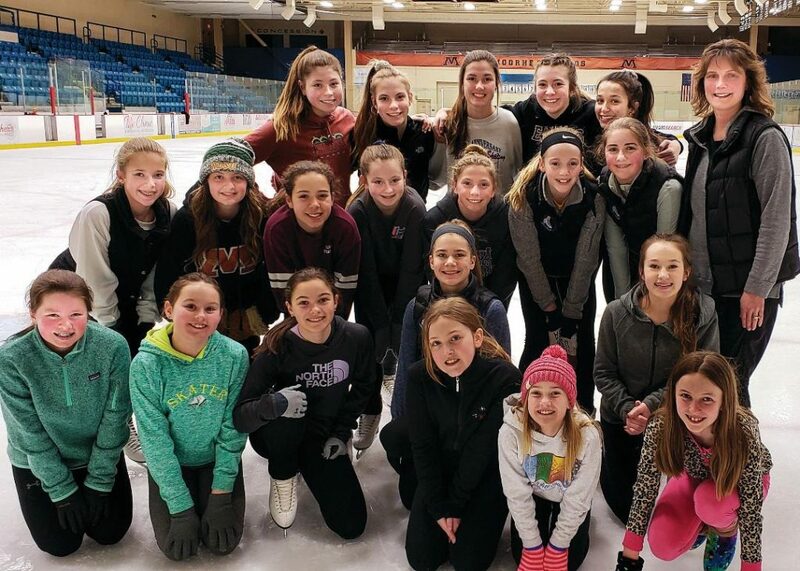 Dawn has been coaching young skaters since she graduated from Moorhead High in 1988. Thirty years ago, her own first show featured five girls in the big opening number, followed by five soloists and 30-some youngsters from her learn-to-skate classes. When the lights come up this Friday, a packed arena will watch 60-some graceful girls in the opening act. More than 20 soloists will take their turns in the spotlight. The learn-to-skate numbers will bring out more than 100 … the youngest just 3. Today, Dawn is employed by the Moorhead Park District to produce the ice show and teach learn-to-skate classes – starting with toddlers as young as 3, and proceeding through eight basic levels. More than 200 youngsters, almost all female, are enrolled at various levels. Shelly is at her side, along with two assistants, Michelle Roman and Katie Paseka. (“I taught Katie from the time she was a little itty-bitty all the way through her gold medals,” she interjects). Among them, they teach Tots classes for little ones from 3 to 5 – six groups of 10 a week. “We always have a waiting list,” she says. After that, they move on to Basic One through Basic Eight. Participation is based on skill and interest, not age. “By the time they’re in late elementary, they generally move up to private lessons or move on to other interests,” she adds. Young skaters can begin private lessons whenever they feel they’re ready. Their youngest private student is 6 and the oldest, a 20-year-old collegian among their 60 or so private students. Dawn also teaches power skating for hockey players, with 25 enrolled at the moment, and occasionally figure skating for adults. Some private students also take part in the separate Red River Valley Figure Skating Club competitions, working their way to medals – like Dawn’s and Shelly’s – in ice dancing, “moves in the field” and free skate. Most take part in three or four juried competitions a year, including last month’s Red River Classic. As Moorhead has added rinks, the competition for ice time has eased. “Now, with a lot more ice, a lot of rinks, we’re pretty okay,” she says. That doesn’t mean, though, that schedules have eased back too far. During winter, Dawn teaches classes in early mornings and late evenings five days a week, plus a few hours every Saturday and Sunday. The timing is considerably easier spring, summer and fall. Thousands of Moorhead area residents – parents and fans alike – will get to see the skills Dawn’s coaching team has burnished this weekend. Performances begin at 7 p.m. Friday and Saturday, and at 1 p.m. Sunday. Other than parental pride – guaranteed to reach the loftiest levels – what will audiences take away from the ice show?